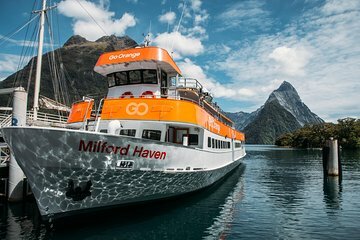 Float on the waters of the incredible Milford Sound during this short, guided cruise. One of New Zealand’s most iconic places, this fiord is where you’ll see mountains covered in vegetation, the imposing Mitre Peak and stunning Stirling Falls. Take a seat on one of the boat’s beanbag deck chairs and take in the once-in-a-lifetime view. Enjoying waterfall mist on boat just underneath was great experience ! Many small waterfalls on the way and rain-forest plants on the mountains was wonderful..